What kind(s) of biking do you do these days? What type of commuting do you do, and when? I ride my mountain bike on most days when the weather is nice, so probably something like 10 hours a week. I also pretty much get around town exclusively by bike. I only really drive to haul heavy stuff (i.e. tanks of welding gas or a whole bunch of bike frames) or to go up to Park City to ride. Observations since moving from Boulder to Salt Lake City? 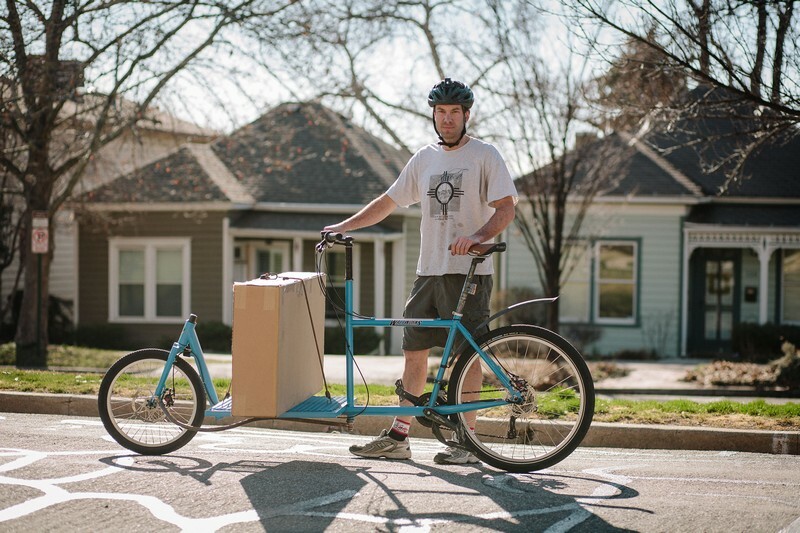 Walt Wehner and one of his custom built cargo bikes. Salt Lake City is not as bike friendly as Boulder, but that's mostly an accident of topography – Boulder has three or four creek drainages that run through town and flood periodically, so you can't build anything near them, which is perfect for bike paths. So in Boulder, it's relatively easy to get almost anywhere in town without ever being on a surface street. Salt Lake City was laid out, as we all know, on a grid, so those natural opportunities for bike paths were mostly lost. All in all, though, I find it to be pretty pleasant for bike commuting, at least in the university/downtown area. Have a bell, have a light, and don't be afraid to take the lane and make the cars wait for you if you think that's the safest way to go. How did you get into cycling in the first place? First memory or experience biking? What do you like about cycling? What keeps you doing it? There is a long, semi-funny story about my first “real” cycling experience. Suffice to say it involved a girl, my ego being crushed, and losing a lot of skin but having to act as if I'd had fun in order to salvage my pride. The second ride went better, and the rest is history. That was about 1999. I enjoy pretty much everything about riding bikes: exercise, fresh air (sometimes), and freedom to explore the outdoors. I actually sort of feel trapped in a car and I really hate to drive them. When did you first get into bike building? I've been in business since 2004, building bikes in one way or another as a hobby since about 1999. The first custom bike I ever built was for Sarah for her birthday, I started it in 2003 and finished in March 2004. What kind of bikes do you build? Any construction or design specifics you'd like to share? I am mostly known for mountain bikes but I do almost everything including road, cyclocross, track, cargo, commuter, tandem, etc. I can build bikes with any method but I generally TIG weld. I build exclusively with steel. I think the thing that makes me a little bit unique among framebuilders is that I'm much more interested in how fit and frame geometry interact to produce the right ride for a customer than most. 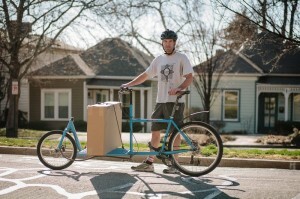 A lot of people can fit someone to a bike but then they mostly don't think much about how that fit (which is really basically just three points in space – bottom bracket, saddle, and handlebar) needs to interact with the positioning of the wheels and weight distribution to get a bike that actually rides the way it needs to. I do a lot of design consulting for individuals and other bike companies and the actual construction (i.e. welding and painting and such) of my bikes is pretty utilitarian – I don't do any fancy paint jobs or decorative stuff in general. So the value I provide is mostly in the design side, though of course I also do a great job with the construction and offer a nice lifetime warranty and such as well. I've designed more mountain bikes (especially 29″ wheel mountain bikes) than all but a few people on earth. What are the elements you like most about your job? The best thing about my job is interacting with customers and figuring out what geometry/parts/setup is going to make them happiest. Plus the flexible hours rule. The worst thing is probably that it's quite lonely a lot of the time and some of the tasks can be very repetitive. What can a potential customer expect from Waltworks, in terms of ordering, cost, and wait time? I usually have about a six to nine month wait list and I ask potential customers for a $200 deposit to hold their place in line. Some customers come visit me in person for fitting/design consultation, others just send in their measurements via the internet. 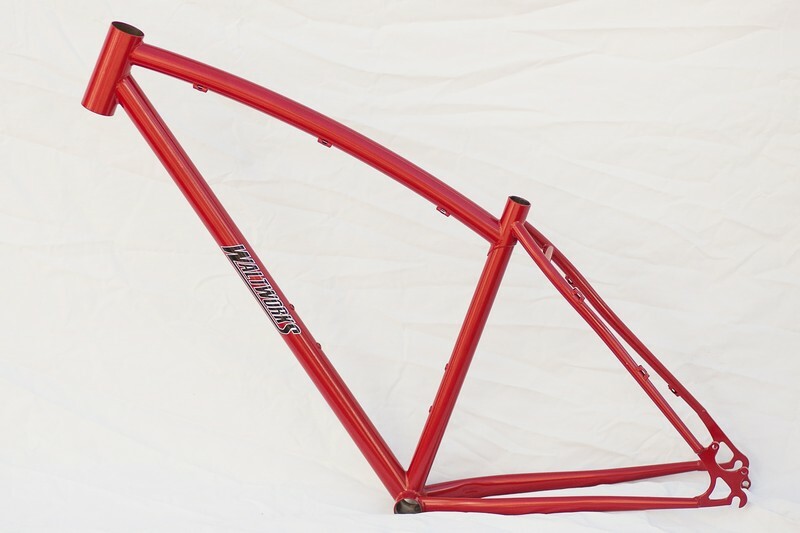 Cost is $1500 for a custom frame, and from $3000 up for a complete bike. You can reach Waltworks Bicycles at [email protected] or 303-359-9392 or online at waltworks.com. Jennifer Leahy is a photographer living in Salt Lake City. You can find her work at leahyphotography.com.